The Flash Quick as a Flash! Discussion in 'Comics Central' started by Ome, Jun 3, 2017.
except for seeing Grant Gustin look so not cute as Savatar. You didn't like the rugged look and floppy hair this time? I wouldn't consider that rugged. I don't consider Grant Gustin rugged. I like him for his cute nerdiness. His Savatar look was just greasy and emaciated. That Eobard is still around.....? 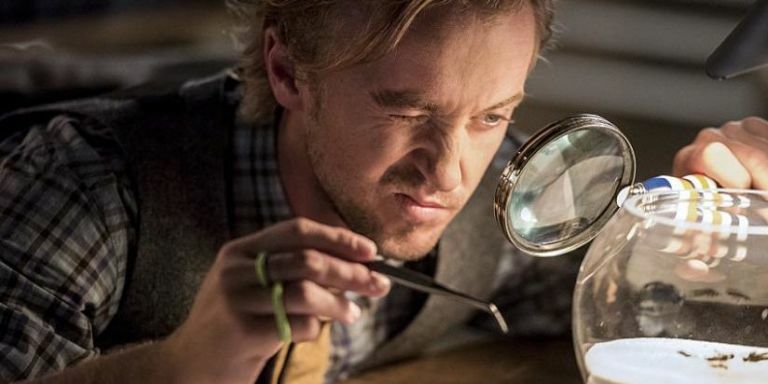 The Flash will be missing Tom Felton's hilariously snide insults in its upcoming season. The former Harry Potter star will be leaving the DC TV show after a single season playing super villain-turned-hero Julian Albert, according to Entertainment Weekly. As of yet, there's no indication that Felton will even return for a guest appearance in The Flash's fourth season… but obviously that may change as the year rolls along. Quick-witted CSI detective Albert was initially an adversary to both Barry Allen and The Flash, the latter admittedly without his knowledge or consent. Gutted! I really thought he integrated with the group effortlessly. That's a shame. I really liked the character. I really liked the character. I always thought he might have had a small shelf life considering who the actor is. 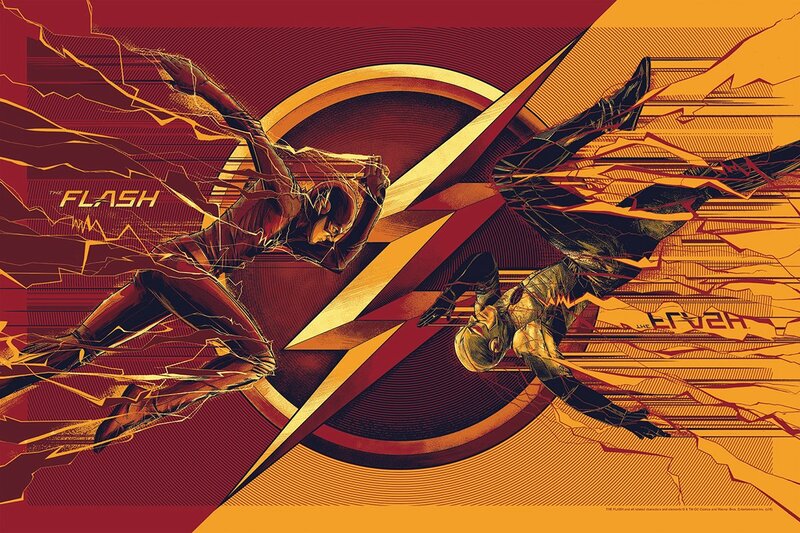 The Flash has unexpectedly started running (pun unintended) on free-to-air television here. It's well behind what I've seen of Arrow as well as my DVD viewing of Supergirl but I can fill in the gaps. Set in present time I'm watching Barry Allen at work while thinking about the last time I saw him on ARROW. He had been hit by lightning so I couldn't figure out what was happening, then it started to make sense as I realised I wasn't in present time, or maybe I was and the jump to nine months later is part of the process. I had the same reaction. I eventually realised that at least part of it was predating the Arrow scenes. This kinda reminds me of SMALLVILLE in that there's many bright colours as well as having the possibility of freaky people with powers, all coming from an experiment from Dr. Wells. Again, the comparison to Smallville, especially the idea that there were other victims of the same phenomenon, also occurred to me fairly early on. That's my main gripe with all these shows - that they surround themselves with a team of assistants and advisors. Traditionally, superheroes were loners, interacting with their friends only via their secret identities. I really enjoyed the surprise of seeing Oliver turn up, his name wasn't in the opening credits and that gave it a better impact. Agreed. I smiled when I saw Barry on the road to Starling. Did you recognize his father? I actually watched the original Flash series way back when. I understand another well-known cast member also appears in later episodes. I'm looking forward to seeing that play out. They're screening two at a time so we just finished season one. I was far too excited when I saw Wentworth Miller & Dominic Purcell in an episode together, but I think that excitement ultimately lead me to disliking the episode, it felt a little too forced and did they deliberately make Miller's character like his one on Prison Break? I like Miller's intensity and his relationship with Barry. Purcell is stunt casting but it pays off if you've seen them together on PB. The season finale was outstanding, I was all emotional when he watched his mother getting stabbed and then when he started talking to her I thought I was going to burst into tears, but so much happened that there wasn't time. Future Flash waved him off for some reason that our Barry seemed to understand but it wasn't clear to me. Eddie killing himself was off the chart!! I realised what Eddie was going to do just seconds before he did it and yet still couldn't quite believe I'd really seen it. Purcell is stunt casting but it pays off if you've seen them together on PB. It really does and in some fantasy way, I stopped thinking about the PB link with these two. It does become clearer as the story continues. I didn't care too much about him when he first came into the story and then I started to realise that I did really like him, only it was too late.